DC, using their Channel 52 promo pages in their comic books, has revealed that the Suicide Squad is getting a new cast of characters. Over the next couple of issues, the squad’s current cast will slowly be transitioned out and replaced with the new squad. 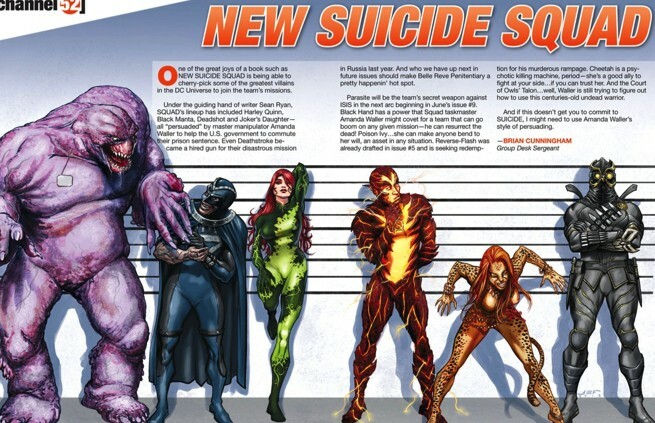 The current team of Harley Quinn, Deadshot, Deathstroke, Joker’s Daughter, and Black Manta will be replaced by DC heavy hitters Parasite, Black Hand, Poison Ivy, Reverse Flash, Cheetah, and Talon. Given the overall power of this new team, it will be interesting to see how this group comes together, whether by A.R.G.U.S.’s doing or if this is the birth to a new Legion of Doom. The full assembly of the team will occur in Suicide Squad #9 and hopefully continue past Convergence with the Suicide Squad comic scheduled to carry on to DC’s new line-up of comics.